Polling stations closed nationwide in Egypt on Wednesday at 10 pm, bringing an end to the three day 2018 presidential elections that started on Monday. Shortly after 7pm, the country's National Elections Authority (NEA) decided to extend voting to 10pm instead of 9pm, due to "high voter turnout at polling stations, and to give all voters the chance to vote given the bad weather conditions in some governorates." Televised footage broadcast on state TV and privately owned TV channels has shown longer queues of voters at some polling stations acoss the country in the evening, especially after an announcement by the NEA earlier in the day that it will be enforcing a fine of EGP 500 (approx. $28) on citizens who abstain from voting in the elections per the country's presidential elections law. The NEA said in the afternoon that the final day of voting had seen "large participation" at polling stations across the country, saying the governorates of Cairo, Giza, Alexandria, and North Sinai, where the army is fighting terrorism, saw the biggest turnout as they did on the first day of polling. Alexandria witnessed a terrorist car-bombing on Saturday targeting the governorate's security director. Two policemen died in the attack, but the security director was unscathed. In North Sinai, the army and the police have been fighting trerrorist groups in the past several years and have been conducting the counterterrorism Operation Sinai 2018 for two months. The high turnout in North Sinai shows that the security situation has not affected the election process, the NEA said. The official turnout will be announced along with the election result on 2 April, unless there is a run-off, which would take place on 24-26 April. Voting started on Monday at 9am at 13,706 polling stations in all 26 governorates. The vote count will start after the polls close at 10pm. Two candidates are running in the elections; incumbent President Abdel-Fattah El-Sisi and Ghad Party leader Moussa Mostafa Moussa. Fifty-four local and nine international NGOs were authorised by the NEA to monitor the elections. The winner will serve as Egypt's leader for the next four years. On Tuesday, the NEA said the first two days of voting had gone smoothly across the country, with initial indications suggesting a high turnout. "No complaints were received regarding the elections, either by judges or by voters, on the first day of elections," the NEA said on Tuesday. The election process was supervised at polling stations by 18,000 judges, with tens of thousands of army and police personnel deployed to secure polling stations. 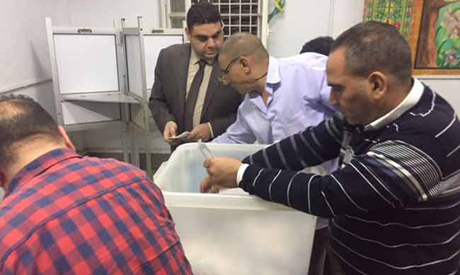 On the first day of the elections, a number of state officials and public figures cast their ballots in the elections, including Prime Minister Sherif Ismail, Coptic Orthodox Pope Tawadros II, and Sheikh Ahmed El-Tayeb, the grand imam of Al-Azhar. The two contenders in the election, El-Sisi and Moussa, were also among the first to vote on Monday. Around 59 million Egyptians are registered as eligible to vote on the NEA's database, officials have said. The largest concentrations of voters are in Cairo, with 7.5 million voters, followed by Giza with 5.2 million, Sharqiya with 4 million, Alexandria with 3.8 million and the Nile Delta governorate of Beheira with 3.7 million voters. In the 2014 presidential elections, where El-Sisi beat his contender – leftist politician Hamdeen Sabahi – with 96 percent of the vote, 24.5 million out of 54 million voters took part, or 47 percent of eligible voters.